A real estate career brings many challenges and rewards. 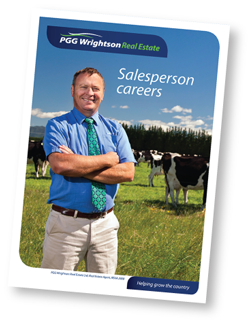 If you are motivated to achieve the rewards and believe you can meet the challenges, PGG Wrightson Real Estate can assist you to make the most of the unlimited opportunities a real estate career can deliver. We can place you in an outstanding team, with an excellent support network and provide high-quality training to develop your capabilities. Our salespeople have many different skills and come into the business with wide-ranging experience. For those with talent for communication, excellent organisational ability and a strong work ethic, building a career and a business in real estate can be highly rewarding. Whether you are new to the industry or looking for a new direction, please contact us. Wherever you want to live and work throughout New Zealand, we will have an office nearby to accommodate you. If you enjoy working with people and believe you can make a difference assisting them with some of the most important financial or business decisions they will make, click here for more information. Call Camron Meade, 027 420 1881 or Deane Pettit, 027 443 1738 today to discuss your future.